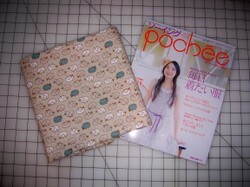 I was recently enticed by a Superbuzzy sale on Japanese sewing magazines. Of course I could not pass it up! And I love the Pochee Summer magazine. 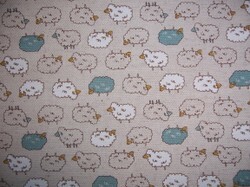 It is also available here (it also provides a good sampling of the patterns available). There are a couple of dresses and tops that I'm just itching to make. I also see that Superbuzzy now has the fall Pochee available that is calling my name! 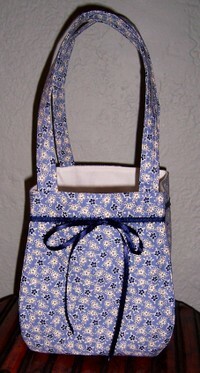 This cute little cube bucket bag is 7-3/4" tall and 6-1/2" wide / deep. The handles tack on about 7" inches in height, making it 15" tall in all. The main fabric, lining, interfacing and ribbon were all from the stash. The main fabric, interfacing and lining required about a half yard of each, so this is a perfect little stash and scrap buster. It turned out sooo darn cute! I'm imagining embroidery... and decorative stitches... and longer handles.... oh what fun! This bag turned out really cute! 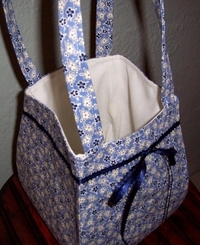 I really enjoyed having to sketch out the pattern pieces and piecing the bag together based upon my knowledge of sewing other tote bags - because I certainly could not understand the Japanese directions :) The only aspect I did not like was all the hand-embroidery - it caused quite a bit of soreness in my forearm and wrist. There are many more designs that I really love in the book, I think the next one I decide on from it will require less of the hand-embroidery! Don't you just love that fabric?!? After searching on the internet, I located this site that has 99 embroidery letter designs... yes, 99. 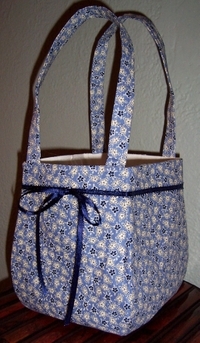 I downloaded one and gave it a test run on some scrap fabric... what do you think? #1 - There is a depth difference between the blue denim and the design fabric due to how they are put together. If I continue making these bags, I will put the two pieces together differently that would eliminate this gap - but for the time being, I don't know how my machine will react to this difference in depth. This is not good - the white bobbin thread is being pulled up through the design. It might be my stabilizer, and it might be that this was a practice fabric and it was not very stiff. To resolve the problem, I think I might try to make an applique patch with the letter on water-soluble stabilizer and attach it after the bag is completed. Does anyone have any other ideas? Erika and I are officially off our rockers! Luckily the diagrams are extremely detailed. Yes, that is a cereal bowl... this is what happens when there isn't a protractor and compass to be found anywhere! (Guess what kids, you really do need them in real life!) DH and I searched high and low for the perfect circle that would fit... and it ended up being the bowl. It was time to cut the fabric! Anti-climatic, I know... but my fingers really could not take it anymore! Jamming a larger size needle threaded with yarn into multiple layers of fabric and felt is literally brutal on the fingers... mine are just throbbing! I need a break. But, don't worry, she's just about done... one more line of hand stitches on the handle, and the sewing machine construction, then she will be finished! This is just one of MANY I want to make. Thanks a lot Erika - I need another obsession like I need a hole in the head!